I think it began with the birds but before that was a count down. But most importantly the birds, because I believe that my toddler brain could not decipher if the birds were indeed in the living room of our Air Force base housing unit or in the music. I was playing with my red fire truck when the song began. There was a count down and then the beautiful sound of birds singing. And then, the placid tones of the Fender Rhodes came in with a mellow arpeggiation in union with acoustic guitar, it sounded like water, and the strings like a cooling breeze. Minnie Riperton’s Lovin’ You is the first pop song I can remember hearing and it is perpetually tied to my very first memory, as described above. I know how old I was at the time because of several facts and other cool indicators. Lovin’ You was released as a single off Riperton’s on January 13, 1975. I wasn’t quite 2 years old at this point, but I am certain that I was 2 when the above memory happened. There are some memories from the early years about which I am uncertain because I have been told some stories some many times that I figure I have created those memories from those stories, those oral histories. Like the one about my grandmother retrieving me from Youngstown, OH to bring me back to DC. For another day. This memory, I own it. It’s all mine. I rarely talk about it; it’s been that precious to me. But as I think about what has influenced my love of music and what music has influenced the sound that I am exploring currently, as unconventional as some of it sounds, it has all been inspired by some amazing pop songs along the way. Lovin’ You is so essentially 70’s to me that it frames my soundtrack and internal soundscape for my early years and pretty much the entire 70’s in a way that disco never could. In a future blog I will talk about disco’s impact. And I know that this reflects my age at the time but that azure gold and vibrant green gradient that is MY 70’s, well, Lovin’ You sounds like what that looks like to me. No one else can make me feel the colors that you bring. And we will live each day in spring time! 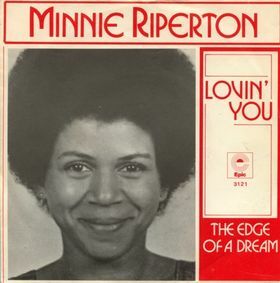 Lovin’ You was written by Minnie and her husband Richard Rudolph. They often partnered as a songwriting duo, but Lovin’ You is by far there most successful collaboration. This song is still one of my top 5 favorite ballads of all time and certainly one of, if not my favorite love songs. There’s a simplicity and earnestness to it that is also a little playful, a little like love can be. Under Minnie’s beautiful soulful asymmetric melody, is the wonderfully sublime yet dynamic arrangement of Rudolph and Stevie Wonder. Lovin’ You, went to Number 1 on the US Hot 100 chart and has the unique distinction of being one of only a few to get there without a percussion instrument. The Rhodes piano is technically a percussion instrument. There is an alternate band version which in my opinion upped the cheese factor on the song and gets rid of the birds. What is great about the lack of percussion in this song is that it firmly places you, the listener soaring through the air, it becomes that type of love making that is less about rhythm and more about dissolving into two-become-oneness. What makes this song for me is how beautifully they make this descending chord pattern I7-vii7-vi-V feel like the song is constantly rising. And at the end of the refrain, there is the I-V/V and there you are perhaps about to suffer an Icarus-type fate but then relief, you keep soaring with those birds that are still there in the track as the strings swell like a wind you’ve caught to ascend higher. This song takes me back to that brief moment, one memory of one place, this Air Force Base housing, the only home I have ever lived in with one of those sliding patio doors. There I am playing with my red fire truck in the azure, gold and vivid green gradient that was the 70s for me. The song, it’s composition and production taught me to love and appreciate simple beauty. A simple asymmetric melody is sublime. A simple chord progression can have beautiful movement. Sometimes you don’t need words and sometimes the wordless vocalizations become the most memorable part of the song. All sounds are musical. Those birds are still singing. I keep them in my head for when times get tough. Dameun Strange is an award-winning composer who lives in the Frogtown Community of Saint Paul, MN. Well known as an artist, activist and organizer, he is currently the executive director of the Northeast Minneapolis Arts Association where he works to promote and support quality and diversity of artistic resources to benefit artists, art and the greater community. He comes to this position after spending 3 years with the Ron McKinley Philanthropy Fellowship at the Bush Foundation as a program officer with the Community Innovation Program. Dameun was born and raised in Washington, DC but moved to the Twin Cities to attend Macalester College where he majored in Music and English. Dameun has worked locally for such organizations as Macalester College, ACORN, MN UNITED for All Families, Grassroots Solutions, and Neighborhood Organizing; and has served on the board of Metropolitan Regional Arts Council, Compas, Headwater Foundation for Justice, Alternative Motion Project to name a few. Dameun is driven by two desires. As an artist, he is driven to create, to innovate, to build something meaningful and that gives people pause. He has a desire to reach deep within himself and pull out something raw and honest. As an organizer, Dameun is driven to bring people together, to find commonalities between communities, to build bridges—to find the soul of the community and illuminate it, building on assets for a strong future. Dameun sees a world where the artist, the creative thinker is no longer viewed as an add-on; where perhaps the term “creative community” is no longer a necessary term of distinction. He sees a world where our creative institutions and people are valued as equal partners in designing strong, equitable communities and arts is seen a vital and necessary part of the development of our youth just as much as math, science and reading. He wants to play an influential role in moving our society closer to this reality. The Arts has a magical quality in that it can open avenues of discussion, tearing down the walls of misunderstanding. It has the power to tell stories that sometimes go unheard. It has the power to heal, the power to move our communities towards wellness. The arts are a powerful tool in illuminating the threads of intersectionality and recognizing the struggles and triumphs of People of Color, enhancing and American culture that is fully inclusive of all our stories.